« Jets Actually Thinking About a Trade for Jason Campbell? On the eve of the 2009 NFL Draft, the Jets find themselves front and center in the QB trade rumors and at the mercy of Eric Mangini. According to Sal Paolantonio of ESPN, the Cleveland Browns have discussed taking Mark Sanchez with their fifth pick if he isn’t snapped up by the Seahawks at number four. 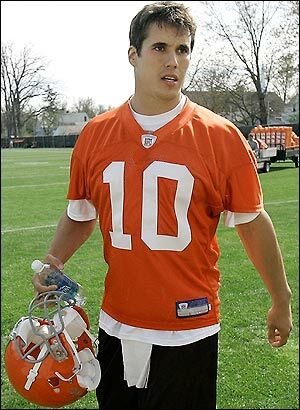 If that comes to fruition, Brady Quinn would become trade bait with the Jets and the Bucs both showing serious interest. Curiously, this scenario comes on the heels of Rex Ryan praising Kellen Clemens on the second day of mini-camp. “I thought he looked outstanding today,” said Ryan. “He did a decent job the first day, but I really like how he took charge of that offense today and really brought that unit out. He made some good decisions, showed poise, had pressure in his face.” Has Mike Tannenbaum got Coach Ryan playing possum with the press? Stay tuned…the latest Jets soap opera is in full swing!